Before honey bees swarm, the workers gorge on stored honey to have energy to survive from the time they leave their old hive until they can forage from their new hive. By gorging on honey they also build up the carbohydrate resources they will need to secrete the beeswax needed to build new combs. In the swarming process, bees usually stop to rest on a tree limb or other structure. Here, they are generally quite gentle because they don’t have a nest with brood and food to defend. However, if the swarm does not find a permanent nesting cavity within a couple of days and remains in its resting place, the bees will consume the honey that they are carrying in their honey guts. This is called a “dry swarm.” The swarm may even start to build comb on their temporary structure. Once they do this, they then have a hive to defend, and they defend their hive by stinging, adding excitement to gathering a swarm! This year has been an exceptionally “swarmy” spring and summer in the Mid-South. Regular rains brought about good nectar flows which often contribute to brood nest congestion. Having the brood nest cells used by the queen for egg laying filled with nectar stimulates the colony to swarm. 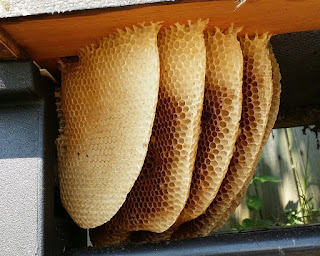 Today’s photo shows the comb built by a summertime swarm that settled underneath an urban bee hive. The colony built combs and even raised brood before abandoning the exposed combs. When the entire colony of bees flies away from its nest, accompanied by the queen, we call it “absconding.” The beekeeper was able to capture the absconding colony when it stopped nearby to rest, and he hived the bees in a modern Langstroth hive with plenty of sugar syrup to replenish the bees’ expended food stores. The colony has accepted its new home; and with the help of the beekeeper, who will be supplying supplemental feedings, the bees should be in good condition to survive the winter.